State and local governments (SLG) are innovating for and with citizens. Whether through open data initiatives, public safety modernization, citizen service improvements, or infrastructure programs, governments are turning to the cloud to provide the cost-effective, scalable, secure, and flexible infrastructure necessary to make a difference. Health and human services (HHS) agencies are using the AWS Cloud to run mission-critical systems that deliver vital health, nutrition, and economic benefits programs. Whether the focus is on organizational transformations, helping to build healthier communities, or transforming payment and care delivery models, HHS agencies are turning to AWS for cost-effective, scalable, and secure IT infrastructure resources. From records management systems and body worn camera solutions, to next generation 911 technology, AWS can help you tackle public safety data needs at every stage of the cloud journey. Dedicated to building programs for use by the justice and public safety community, AWS services support customer CJIS requirements by addressing the CJIS Security Policy Areas. Cities are leading the way in innovation with smart cities and transportation solutions that span open data initiatives, traffic analysis, citizen service improvements, and Internet of Things (IoT)-based smart city projects, such as early flood warning systems, predictive analytics for road maintenance, and efficient trash pickup. AWS securely modernizes and simplifies the primary functions that drive the elections process by enabling rapid deployment and effortless scaling of critical systems for customers who administer, promote, and protect the electoral process. Officials can focus on running elections rather than building underlying infrastructure, and the cloud cost-effectively supports their efforts to scale. 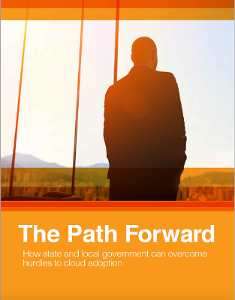 Even though cloud adoption is broadly embraced in many industries, government still lags behind. Perceived hurdles such as cost savings, security, legacy systems, and human resource concerns are often the culprits. Download this paper to see how, when armed with the facts and a capable cloud service partner, government IT leaders can approach the cloud with confidence. Kinesis Firehose ingests data to S3, which then holds the raw, pre-processed, and post-processed data as a data lake. Run queries using Amazon EMR, Amazon Athena, Amazon Redshift, or Amazon Redshift Spectrum. Use Amazon QuickSight to visualize data to make informed decisions. If you are running machine learning (ML) workloads, you can use Spark ML, Python, and MXnet to run ML queries. Use the outcome of the analysis to increase targeting accuracy and optimize targeting algorithms. AWS has the broadest and deepest set of machine learning (ML) and artificial intelligence (AI) services. On behalf of our customers, we are focused on solving some of the toughest challenges that hold back ML from being in the hands of every developer. Not only can you translate tweets, but you can also understand what is being said, the sentiment, and the key people, places, organizations, and things being discussed. You can do all this without needing deep data science skills or hiring a team with those skills. Our webinars help IT practitioners, CIOs, CTOs, CSOs, data scientists, and engineers with little-to-no AI/ML experience, find their best use case and build a proof of concept. Unexpected events can have longstanding business and reputational impact, particularly for organizations that house complex systems. To help your systems become secure and redundant, AWS offers tools to build disaster recovery and business continuity protocols, so that you can protect your organization without incurring the expense of another physical site. Data is your organization’s most strategic asset – making safeguarding it a priority. Federal agencies, educational institutions, nonprofits, and state and local governments must keep their data secure, available, and safe from threats, such as natural disasters and cyber attacks. This eBook provides high-level business benefits of backing up data to AWS, instead of using traditional backup strategies that involve maintaining tape libraries and/or secondary failover sites. Learn how to build disaster resilience into every application for business continuity, security, and support for instant failover and high availability in disaster recovery scenarios. With the most complete data management platform and numerous partner solutions, AWS can help optimize the entire lifecycle of your data, including collection, ingestion, processing, analytics, short-term storage, and archiving. We also provide sophisticated capabilities to support real-time streaming and analytics, petabyte-scale warehousing, business intelligence tools, and machine learning. Learn more about Data Analytics & Management. AWS-powered data lakes can handle the scale, agility, and flexibility required to combine different types of data and analytics approaches to gain deeper insights. Before the cloud, fixed capacity and provisioning lead-times were getting in the way of the analytics. With AWS, we can now expand online storage seamlessly and scale compute dynamically to meet the demands of our analysts and data scientists and keep pace when market volumes spike. In order to migrate to the cloud, we worked on overcoming a few initial questions: Is it secure enough? How will security and governance controls be implemented? And can we improve our security posture with cloud infrastructure? AWS allows for rules-based, automated compliance. At the corporate level, you can create rules regarding how your AWS infrastructure can be provisioned and configured throughout your agency. When you are creating infrastructure for a particular project, you can create reusable templates that allow you to have a consistent environment for development, testing, production, and validation activities. Once deployed, AWS has tools to continually test, monitor, and log events that occur. You can use these tools to rapidly detect deviations from corporate policy and sound alarms when they occur. Cloud security at AWS is the highest priority. As an AWS customer, you will benefit from a data center and network architecture built to meet the requirements of the most security-sensitive organizations. As with everything at Amazon, the success of our security and compliance program is primarily measured by one thing: our customers’ success. Our customers’ requirements drive our portfolio of compliance reports, attestations, and certifications that enable our customers to run a secure and compliant cloud environment. As evidenced by the full range of our Authorizations-To-Operate, third-party attestations, and certifications, the AWS Cloud provides government customers with the only one-stop shop to handle Public, For Official Use Only (FOUO), Sensitive, Secret, and Top Secret workloads. A cloud Region designed to host sensitive data, regulated workloads, and address the most stringent U.S. government security and compliance requirements. "The Xaqt solution built on AWS enables us to perform preventive roadwork. We expect to save up to 50% compared to emergency repair." "Multiple teams in our department can access up-to-date crime report and case data in Mark43 RMS all day, every day, because it is based on AWS." To support the city’s Vision Zero traffic and pedestrian safety initiative, New York City Department (NYDOT) built web applications Vision Zero View and iRide NYC on the cloud. “The AWS infrastructure performed flawlessly and we were confident it could handle the load. There were no performance issues, and 80 percent of users accessed election maps on mobile devices."